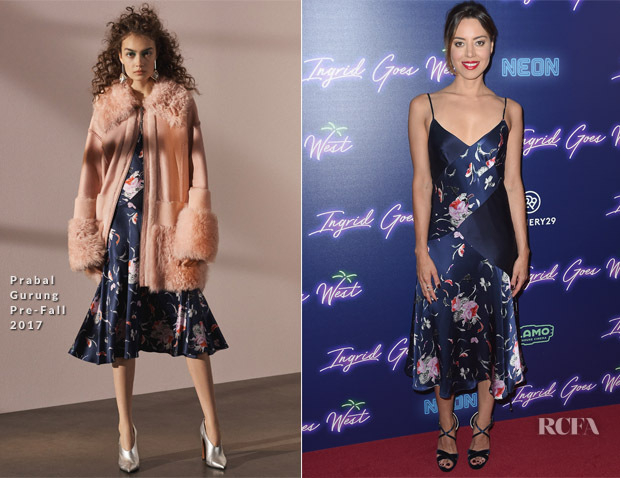 Following her appearance on ‘The Tonight Show Starring Jimmy Fallon’, Aubrey Plaza continued down the easy-luxe path for the New York premiere for ‘Ingrid Goes West’. I love how her fluid Prabal Gurung Pre-Fall 2017 navy slip dress combines minimalist elegance with a fresh, floral print for a truly modern feminine look. There’s usually a cheeky, fun or quirky element to Aubrey’s red carpet looks, as we saw at the Miami premiere, but strait-laced works just as well for her. Jimmy Choo ‘Lola’sandals completed her look.